Sometimes, despite not having much to work with, you can get a little out of a lot. Many people are experts at turning what, at first glance, appear to be small rooms in their home into large open spaces that look many square feet bigger than they actually are. This is especially the case with kitchens. If you are thinking about kitchen renovations and are worried that your kitchen is too small for them to make an impact, below are four renovation ideas for a small kitchen that really work wonders. Many people with small kitchens would love nothing more than to have extra space for new appliances, a bigger sink, etc. One of the best ways to maximize what little space you have in your kitchen is to do away with closed storage, and opt for open storage. Closed storage takes up horizontal and vertical space in your small kitchen that you simply can’t spare. Remove those closed storage spaces and opt for open storage instead (including shelving units and open pantries) instead of bulky cupboards. The thing about large kitchens is that you can really hide the design and style flaws in all of that open space. In a small kitchen, not so much. Everything has to coordinate and flow together well, so it is essential that you not only mix your materials well, but have a mix that is distinct enough that it will create the feeling that there is more space in the kitchen than there actually is. If everything in your kitchen is currently uniform, your kitchen renovations should seek to break up that uniformity. Solid surfaces in a kitchen (particularly the cabinetry) make the space look smaller than it is. To add some real depth and expansiveness to your kitchen, go with glass. Being able to look into glass casing makes the viewer feel as though they are in a room that is much more spacious. If your kitchen has a door to it, even something as simple as installing a glass door can do wonders for increasing the illusion of space. While we can’t all have restaurant-sized kitchens, we can, with some careful planning and knowledge of space creating techniques, have a kitchen that looks, and more importantly, feels, as big as it possibly can. 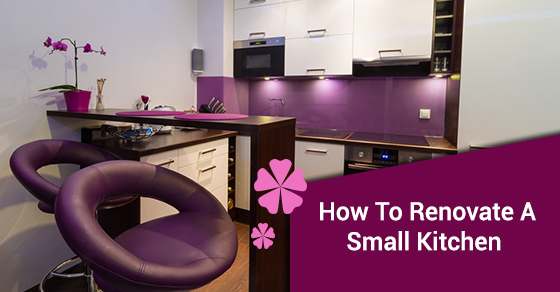 If you are planning kitchen renovations on your small kitchen, and are unsure about where to start, keep the above tips in mind and end up with a small kitchen that punches well above its weight.